I have always been a nerd. I knew I was a nerd, but I was closeted until college. I figured out how to “code switch” – to pass for whatever I needed to pass for – in different circles. I discovered that despite my constant need for self-reflection, introspection, and intellectual challenge, I also had this intense need for human interaction. I had to talk to people. I had to socialize. And it was my extraversion that made my nerdiness cool.There were definite perks to being a nerd – and an extrovert. 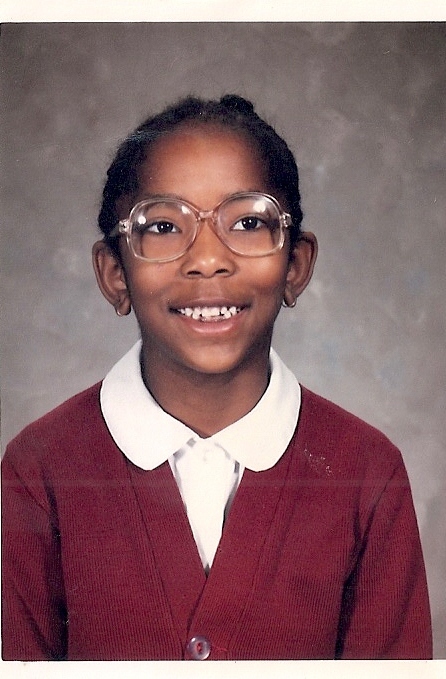 I wore the geeky glasses as a child but I was so tall – five foot five in third grade – that no one dared pick on me. I worked against my nerd to make it through school. And I made it relatively unscathed. Only a few fights and suspensions here or there gave me enough edge to look the part in East Oakland. I wore being kicked out of Catholic School in sixth grade like a badge of honor, cementing my street cred in middle school. By high school, I managed to keep my popularity despite moving into a new public school system in North Oakland. Going to Oakland Tech for the AP and magnet programs was one of the best decisions I ever made academically. I had best friends on both sides of campus. My cool friends loved my sarcasm, bluntness, and quick wit. They never realized most of that stemmed from a deep social awkwardness that made it almost impossible for me to grasp and appropriately respond to external social cues. It was there that I learned how important code switching would be for me for the rest of my life. On the other side of campus, I was smart-ish but not the scholar savant some of the white and Asian students boasted of being. This academic thing was relatively new to me. I was just making it up as I went along. But my brown skin and gender gave me a leg up with teachers and administration. I was smart – scoring 4.0s pretty consistently – but my personality made people believe in me. They took me seriously. They thought, “She really is something special.” I know they did because they often told me that. Being a nerd granted me the sense of fulfillment my intellectual hunger required. The books I read within hours, the math homework I always finished during class, the extra credit assignments I did to fill the time, they were like my dirty little secrets I hid from my cool friends so as not to seem too “square”-ish. Conversely, all the “smart” kids probably wondered why the hell I was in class with them on most days. My school was 90% black but my AP courses were 90% white and Asian so I stuck out (though me, my cousin, and two good black girlfriends had a little clique forming). Being an extrovert gave me a deeper sense of purpose and likely helped me cope with the natural awkwardness of adolescence and the teen years. It once got me kicked out of Calculus class after my incessant talking sent the teacher into an embarrassing tirade. “Why are you here wasting my time? You are never going to pass this course. I don’t even know how you made it here. Just go!” he told me. I sauntered out as if unphased but, in actuality, I was crushed. I cried about it. I went on to USC and got an engineering degree – partly to spite that cruel teacher. Going back two years later and seeing the look on his face when I told him of my academic accomplishments was gratifying to say the least. At times, the poor little extroverted girl inside of me causes the little nerdy girl to blurt out stupid smart things when I get nervous. Sometimes, the nerdy girl introspects so much that she psyches the extroverted girl out of being witty and clever, making her weird and overly verbose. In other instances, my idiosyncrasies make me seem like a foreigner amongst close friends and a homegirl amongst strangers. In any case, both sides of me have their perks. And the combination of the two has made for some the oddest-ly enriching experiences of my life. But, I have come to appreciate the excess and necessity inherent to them both. Embracing them both has made me love me. I am the most awesome protagonist around. I still code switch from time to time, but less and less as the days pass on. I imagine one day I’ll put the switch away and let both me’s have at it. For now though, I am going to keep enjoying the perks. Next story ‘Trophy Scarves’: Who is Nate Hill Really Indicting?